The questions presented at Nina's Coffee Cafe. 1) Can you name this MN Courthouse? 2) Can you identify your MN Supreme Court Justices? 4) Can you get charged with drinking underage because of Facebook pictures? 5) In MN, does having "bong water" count as drugs for drug charges? 6) What are the top two Constitutional Rights most people forget to use when arrested by the police? 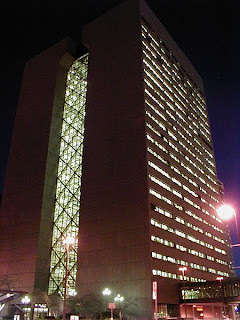 1) It's the Hennepin County Government Center in Minneapolis, MN. 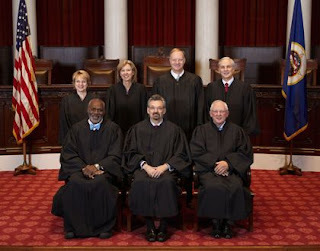 2) Top Row: Justice Lorie Skjerven Gildea, Justice Helen M. Meyer,Justice G. Barry Anderson, Justice Christopher J. Dietzen, Bottom Row:Justice Alan C. Page, Chief Justice Eric J. Magnuson, Justice Paul H.Anderson. c) Yes, similar to boating, operating a snowmobile while intoxicated can result in being charged with a DUI. f) Again, no cases have been reported in Minnesota, but as we have mentioned in previous blog posts, it does happen. g) Likely, although no reports of receiving a DUI from a wheelchairhave been reported in Minnesota. Arrests have been made in Georgia andWisconsin. 4) Yes, in November reports ofthis occurring in Wisconsin came to light. Although no reports to thisextent have been seen in Minnesota, it's likely to happen. If ithappens to you or a loved one, contact Ascheman & Smith immediately. 5) Yes, in a recent Minnesota Supreme Court ruling, "bong water" was determined to satisfy the requirements for a controlled substance. 6) The right to remain silent, andthe right to an attorney. Although most people know these rights, theyfail to use them. If your arrested don't talk to the nice friendlyofficer. Tell her you want your attorney. Put us in your cell phonenow, don't waste time trying to find one if it happens. Better to haveus and never need us.